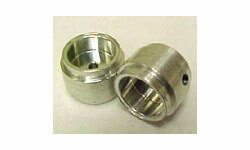 THP3206 - Aluminum setscrew rear wheels for molded tires [THP3206] - $9.99 : TSR Slot Cars, TSR Slot Cars - Dedicated to Slot Car racing, collecting, restoration, track design, electronics and software. Aluminum setscrew rear wheels without tires. Use them to install the THP3212 TSRF-Ortmann tires, or TSRF Indy Grips tires or T3212 tires. Supplied with setscrews. Sign up for email news, sales notices, and ideas.